Shadow of legend is the world's first High-Performance, Cross-Platform MMORPG (Massively Multi-player Online Role Playing Game) targeting mobile devices. Players assume the roles of world heroes as they explore, adventure, and quest across the vast world of Agnes. 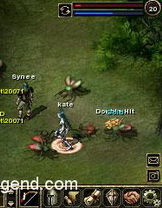 Shadow of Legend allows thousands of players, whether they are on their PC or on their mobile device, to simultaneously interact with each other in the same world. Whether the players adventure together or battle one another for power and glory, the players can expect all the best features of an MMORPG to play seamlessly in the palm of their hand. Free to download and free to play. i want to install this programme to my htc hd mini phone.